Who knew I'd learn about the Danes while vacationing in Zanzibar! I chanced upon the book 'The Year of Living Danishly' while scanning through the bookshelf at the resort during my African vacation. I traded my unread Paulo Coehlo 'The Winner Stands Alone' (no regrets there) for this book with its attractive blue color. Cover aside, I was curious to know what makes Denmark the world's happiest country. Scandinavian countries have always harbored my wanderlust-heavy fancy and this book held insights into what made one of these countries known for its happiness levels and living standards. What's the deal with this book anyway? 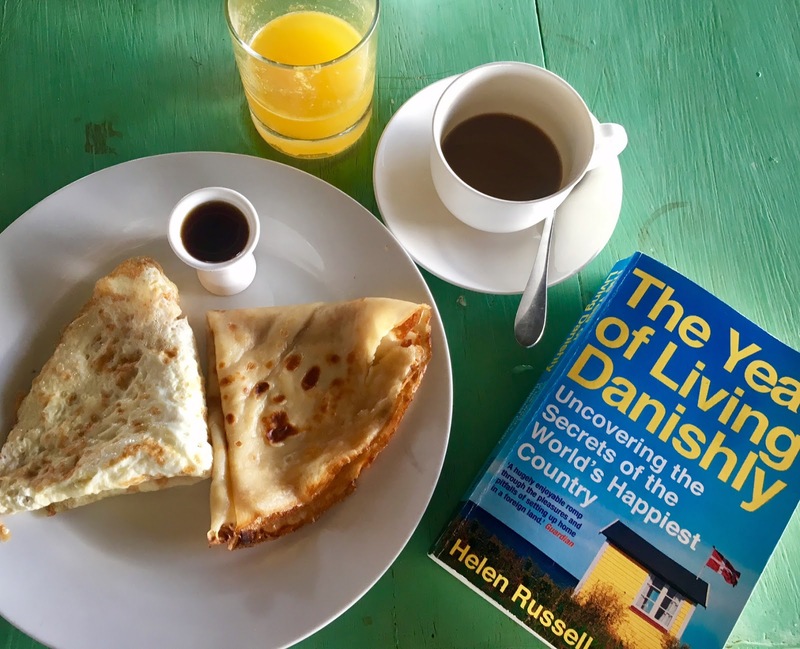 'The Year of Living Danishly' is written by Helen Russell who used to write for Marie Clare UK, a job that was adding to the conundrum of her rat-race infused meaningless London life. A job offer from Lego for her husband signaled a move to Billund in Denmark, spiraling Helen into a Danish expedition, an exciting yet nerve-wracking journey of uncovering secrets of what makes the Danes happy, all as she too learns how she can seek happiness living her Danish life. Her laborious research and numerous interactions with Danish experts gives you, the reader, unparalleled access to living life The Danish Way. So what's makes the people of Denmark happy? A lot. Let me begin with hygge. If you haven't heard of it before, you've been living under a rock; it's a trend that has captured the world by a storm. It's a word that encapsulates the Danish way of seeking happiness by creating an ambiance of coziness; so lighting a candle, hugging a mug, curling up in a woolly blanket and reading a book while it's raining outside means you've achieved hygge. It's not an easy concept to explain, and I may have not gotten all of it right 100% so I'll let this VICE News video take you deeper into it. It'has inspired my next read 'The Little Book of Hygge' by by Meik Wiking. Helen shares that Danish people love rules and planning. This takes out the stress of many things and hence that makes them happy people. Danes also are a closely integrated community; many rarely marry out of their nationality, nor migrate elsewhere, thus making them think of their friends and neighbors as their very own people. The resulting trust created further creates a sense of satisfaction in the Danish life. The author was surprised to learn that Danish parents can leave their toddlers unattended outside the supermarket while they hop in to buy something they missed from their shopping list - such is the level of trust. Danish residents also pay very high taxes - up to 51.7% of their salaries (depending on pay bracket). But they see logic in it because the State takes care of them. Healthcare and education are free. For instance, it is not strange for people to pursue their love for learning even up till their late 20s before they begin work; and they have the flexibility to look for a job they truly enjoy - all because they have the safety net of social welfare that will see them through. They work six hours a day, value time spent with their friends and family and can snuggle with some of the world's tastiest snegels all upping serotonin levels. But all external factors aside, Helen's research reveals studies that show that - wait for it - the serotonin gene is higher among Danish and Swedes (oh, the injustice). Perhaps this is what makes them so acceptable about a four months long, dark and brutal winter with depressing levels of darkness. What, Denmark is not Utopian just yet? Most people Helen interacted with in her quest to identify Danes' sources of happiness, said they were at about an 8 or 9 on 10 in their scale of happiness. They acknowledge how privileged they are to be born Danish, living the way they do, and with all humility, admit that their problems are of the first world kind. Yet all is not Utopian in Denmark. A sense that healthcare is provided for makes Danes a tad careless with their health as they drink like a fish and puff tobacco like a chimney. There's a lot left to be desired when it comes to gender equality. Most Danes, male and female both, would have been in a physical fight by the time they would have graduated from school. Divorce rates are also sky high in Denmark because separation is fairly simple and affordable legally. On an epicurean note, you may be surprised but until Noma hit the scene, Nordic cuisine pretty much was potatoes and pork, and most of the culinary scene outside of Copenhagen still continues to be of the starchy kind. But like our humorous author concludes, if there is anywhere in the world you have to be stressed, it would rather be in Denmark. And how can you and I live Danishly? 2) Get hygge - This I think I excel in. While it may not qualify for hygge, for me making a cup of filter coffee, cuddling under my sheets and watching Big Little Lies makes the cut. 3) Use your body - I am proud to say I have been successfully ditching my lazy instincts and making it on time for my evening Yoga classes on most days after work. Do you go jogging, dancing, anything? 4) Address the aesthetics in that, invest in making your surroundings beautiful - you really should see my beautiful blue chest of drawers adorning my studio. Keep your space clean, positive and bright. 5) Streamline your options, meaning, don't let too many choices bog you down. Keep it simple. Who knew I had a Danish vein in me for a long time now! I have always believed that less is more and that reflects in my space and my possessions. 6) Be proud - Danes are a proud lot and they have reasons to be. What's my reason to be proud? My journey so far, the mistakes I learnt from, everything that has shaped my character and made me, ME. Find your reason to be proud. It could be a hobby or interest you're pursuing or the lasagna you're an ace at making. 7) Value family - Well, well, well, I am more Danish than I thought... family first! 8) Equal respect for equal work - Let's promise to treat everyone with kindness regardless of the colour of their skin or passport. 9) Play - Remember it was a Danish father who invented Lego and they are the masters at 'play'. Let us learn to rediscover that child in us and get out and indulge in fun activities - baking, drawing, building a Legoland house, whatever! 10) Share - Sharing is caring, so Helen tells us we can live Danishly if we start sharing more. This could mean baking a cake for your colleagues or inviting friends over for a meal - let's all do our part in bringing more warmth to the table. This book was truly an insightful one to read and Helen's adventures are engaging to follow. If you want to hear more about her story, this is a good video to start with.